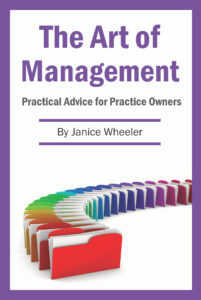 Strategic planning is a key element for the growth of any practice or business. The owner of a practice needs to decide on what he or she wishes to accomplish in a certain period of time. Likewise, the team members can each make a strategy for their own aspect of the practice that coordinates with the overall plan. Every position can work out ways, big and small, of improving their area and taking it up a notch. It is very easy to just let things ride and do the irreducible minimum of a job or the whole practice. That is apathy setting in and one must fight back against that or life can become one big boring snore. To enjoy a practice or any functions within it, you need to create some interest and fun and enjoyment. It is YOU who create it. The furniture, files, phone … they cannot create, only living beings like YOU. If you are not having fun, then you have stopped making it so. Having an ambitious series of plans or steps to accomplish in a tight time frame that will increase service quality and production in an enjoyable atmosphere will create great morale for all involved. So, get started (if you haven’t already) and make 2016 an EPIC year for everyone! And reap the enjoyment of accomplishment.